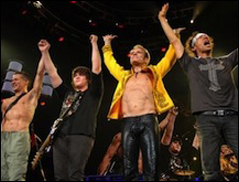 LOS ANGELES (VIP NEWS) — Comments by Van Halen frontman David Lee Roth that the band will tour Europe beginning late this year are incorrect, according to Irving Azoff, manager for group founders Alex and Eddie Van Halen and bassist Wolfgang Van Halen. Azoff did confirm that Roth will indeed front the band that will play the scheduled dates, which include the Stone Music Festival in Sydney, Aus. April 20; June 21 at the Tokyo Dome, and June 24 and 26 at Osaka’s City Central Gymnasium. Van Halen will also headline the final night of Rock USA festival July 20 at Ford Festival Park in Oshkosh, Wis.
Van Halen played 46 shows last year and grossed $54 million, with attendance of 522,296, according to Billboard Boxscore, eighth among all touring acts for the year.